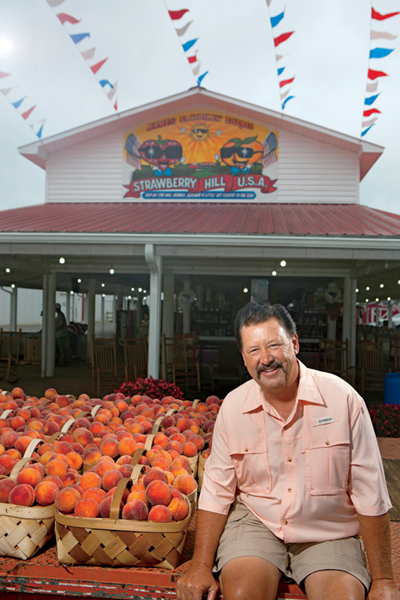 Produce and agritourism—as well as family and perseverance—make a winning combination at Strawberry Hill USA. While disking one fall day, James Cooley had been contemplating a means of marking his irrigation heads. The turned, reddish-brown dirt may have seemed barren to some, but to this Chesnee, S.C., farmer, his farm fields were things of beauty and sources of pride, and a promise of what was to come. He tried plastic fenceposts, PVC pipes … but those options marred the landscape. Finally, an ingenious solution for row markers came to him: American flags. From there, the idea grew. Today, his 1,200-acre farm and farmers’ market, Strawberry Hill USA, features 400 flags sprouting all over the property. James even adorns his large open-air produce sheds with them, replacing the stars and stripes three times a year. 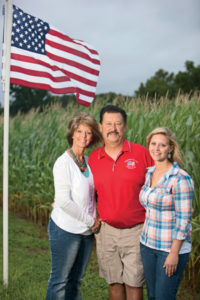 Solving a practical problem with patriotic flair is typical of this innovative farmer’s flexibility. Presentation remains important to him. “Grande rojo,” he says to one of his Mexican laborers, plucking out a big red sample from just-picked peaches. “Make sure that everybody picks big and red. Leave anything on the trees that can stay until tomorrow. All we want is the very best.” The employee nods. Message received. The same care applies to every aspect of his operation, 850 acres of which comprise peach trees and 120 acres in strawberries. The rest includes acreage for cantaloupe, blackberries, pumpkins, pickle cucumbers and squash. He also grows a 10-acre corn maze and 100 acres of wheat and soybeans, used in rotation with the peach trees. Besides other venues that range from Atlanta to Minneapolis, James sells at the main Chesnee location and another large market in Gaffney, S.C. The Chesnee market also has a year-round café run by James’ wife, Kathi. Depending on the season, farm tours offer the corn maze, wagon rides, pumpkin or blackberry patch visits, calf feeding, pig chasing and more. Daughters Bethani and Brandi handle the farm’s marketing and agritourism. Two other daughters, Brooke and Brittani, work off the farm but help occasionally. Kathi (left), James and Bethani Cooley work together to make their farm-related businesses successful. 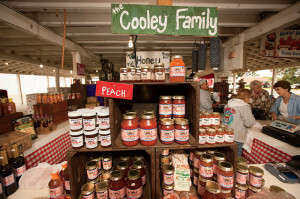 The farm’s fruit stand still sports the name Cooley Brothers Peach Shed, homage to James’ deceased father and uncle who established the farm in 1946. Back then, the Cooleys sold some produce directly, but the farm was primarily a packing shed. Recently, the farm began growing fall strawberries in tunnel greenhouses. The plants are grown the same, except they get covered when it’s cold. In South Carolina, the cold weather can be interspersed with warm, sunny days well into winter, making the tunnels a terrific option for extending the growing season. “These fall strawberries, we pick almost to Christmastime,” James says. “Whatever it takes to make it work, that’s what we’ve got to do,” he says of farming. “It changes daily.” For instance, he recently landed a contract to grow peaches for Peterson Farms, the largest privately owned fruit processor in Michigan, who packages peach slices and cubes for McDonald’s and Wendy’s. That adaptive attitude helped James win the Swisher Sweets/Sunbelt Expo Southeastern Farmer of the Year for 2013. Among the prizes was a $15,000 cash award for the top title, plus $2,500 as a state winner from Swisher International and use for a year of a Massey Ferguson® tractor. “I’d get those checks out and I’d rub them in my hand,” he says. “[I’d think], ‘I’m going to get me a truck. No, I don’t think so.’ And I’d put them back.” The winning checks sat for so long, they had to be reissued. The Chesnee market sells their fresh produce. There’s little chance anyone meeting James would ever feel pity. 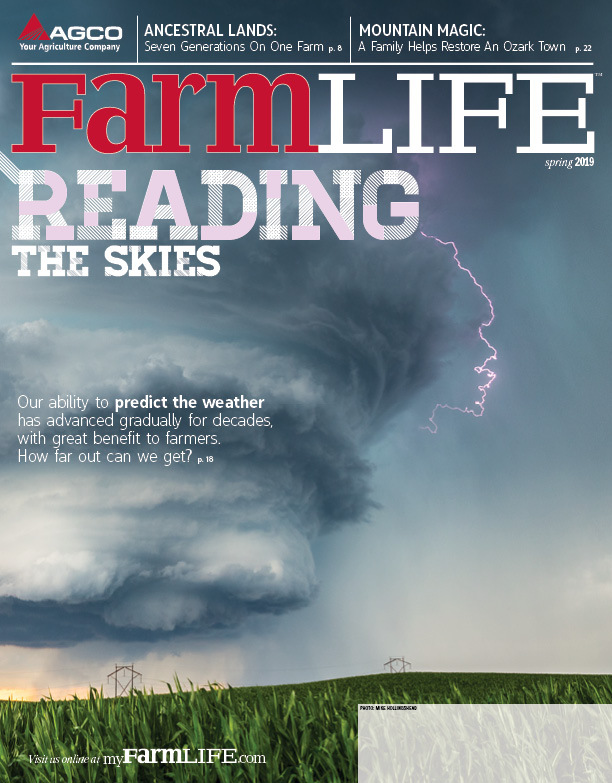 A whirlwind of motion, this stellar, storytelling farmer with a ready smile draws people in. He deals daily with major physical limitations without complaint, making his story that much more inspirational. Two Cooley family members almost lost their lives on Oct. 13, 2002. James and daughter Brooke were riding on a new motorcycle, when he failed to make a curve and ran into a truck. Brooke underwent several operations, unaware of her dad’s status until she recovered. “He’s never been one to lay down when somebody tells him that he can’t do something,” Bethani says. The family relied heavily on their faith throughout the ordeal. Meanwhile, back at the farm, the community rallied: “A bunch of farmers came in and planted the strawberries,” Kathi says. Brandi, who had recently graduated from Clemson University, returned to help, launching the farm’s agritourism venture. “When James finally got to come home, [the community members] stood with signs up and down the road,” says Kathi. Yellow ribbons adorned the trees. Today, James’ left leg is paralyzed and his shattered hip causes near-constant pain. But for the man who generated such an outpouring of love, there’s still no room for pity. He will tell you, flat out, he is a blessed man.